Long time no post! It has been a busy and exciting month for us. Our tot is promoted to a big bro as we welcomed our new baby daughter. It has been pretty hectic but good hectic. =) Foodwise, I have been consuming a whole lot of seaweed soup thanks to my Korean custom. In Korean culture, we eat/drink seaweed soup after giving birth as they believe seaweed soup cleanses your body and helps you recover. Good thing I actually love seaweed soup. With a newborn at home, I haven't really cooked anything. Luckily, my mom stayed with us for a while so that was a big help. Cooking, caring for the baby and all the support. Now that everything's back to normal, I started to cook. My favorite breakfast of all time, French toast. But I wanted something different. A, I didn't feel like standing by the stove flipping french toast. B, I felt like making something cute. 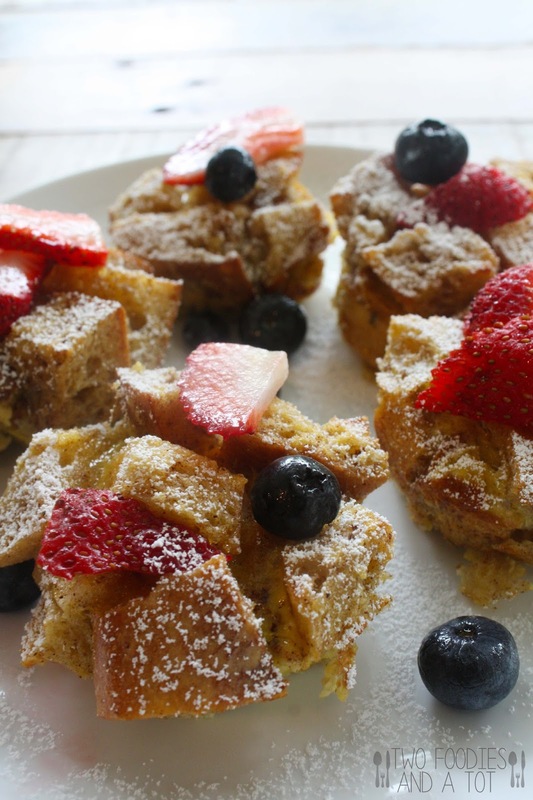 So there you go, french toast cups. Mmm...Soft center and crusty top. Cinnamony sweet bites with fresh fruits. It is a very cute variation for french toast. 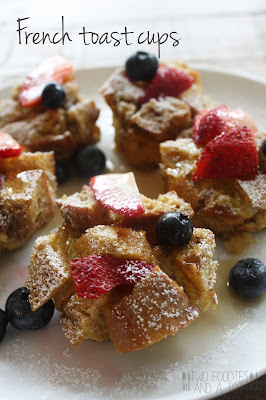 I am a sucker for any kind of french toast so I am kind of bias but this is great if you like a little bit of bite. When I'm not using challah, I like using stale baguette for french toast because of its crust. And this muffin pan cup version definitely showcases the crust. * Makes about 10 individual cups. 1. Preheat the oven to 350F and grease a muffin pan. You can line it with cupcake liners too. 2. In a bowl, whisk together eggs, milk, sugar, salt, cinnamon and nutmeg. Soak the cubed bread in the mixture for a few minutes. 3. Scoop the bread and fill each cup of muffin pan. Drizzle leftover custard over the bread. Bake for 25 minutes. 4. Plate them and dust with powdered sugar.